Unlike ESSE’s enamelled cookers, which are designed to contain heat within the body of the cooker, the Ironheart has convection panels in the side to radiate warmth like a wood-burning stove. 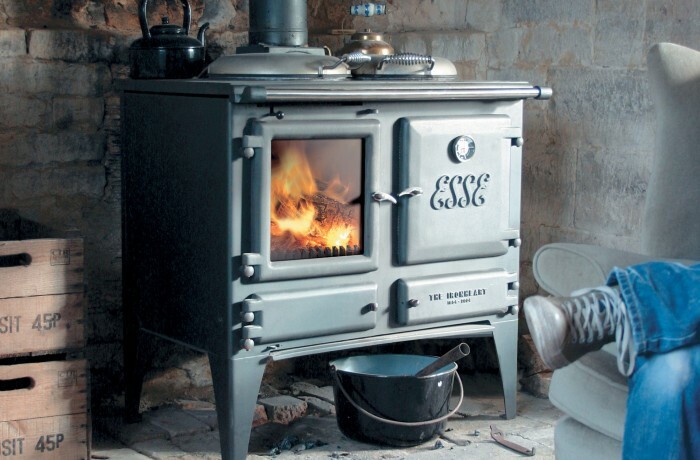 The large firebox can burn wood or smokeless solid fuel and heats the room as well as the oven and hotplate. The Ironheart’s hypnotising flame pattern can be appreciated through the large, clear glass door. Primary and secondary air controls allow a high level of control. The Ironheart gives out up to 9.7kW to the room depending on fuel type and settings; this heat output is comparable to two medium-sized woodburning stoves. However, it is supplied with a heatscreen which can be hung in front of the firebox for your comfort while cooking. A clean-burning design and minimal emissions make for an efficiency level of up to 81.8%. The Ironheart is also available with a domestic hot water boiler. Supplied ready to burn solid fuel or wood, the Ironheart can also be ordered with a specially designed log grate. If you are likely to be solely burning wood, this log grate gives significantly extended burn times.